The summer months seem to be filled with patriotic holidays, so I usually decorate with a patriotic theme from Memorial Day to Labor Day. This low cost wreath is easy to make in less than an hour ! I added stars to my version, but I've seen other similar yarn wrapped versions where people added fabric flowers, or other interesting touches. I prefer the simple clean look of just the American flag, but feel free to embellish yours to fit your style! To make my wreath I started by making my own foam wreath base for just pennies, instead of buying the more expensive wreath forms from the hobby stores. I bought a 6 ft. long piece of 1/2 inch foam pipe insulation from the hardware store (Lowes), for 97 cents. cut in half and duct taped the ends together and got two wreath forms for about 50 cents a piece!!!! 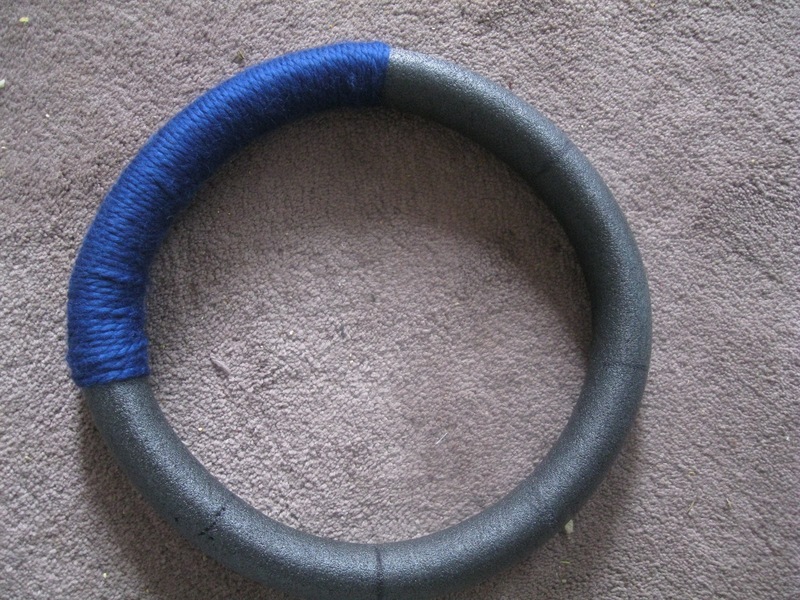 Jan's Tip: For another cheap way to make a foam wreath is by cutting down a pool noodle to the size you'd like. They are usually at the dollar store. But, the foam insulation is at the hardware store year round and pool noodles aren't. 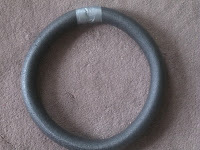 For me the easiest way to make this wreath is to divide the wreath into sections like a clock. Using a pen or marker make a mark at what would be the 12, 3, 6, and 9 o'clock spots if your wreath were a clock. Then fill in the other numbers, making sure to space your marks out as evenly as possible. wrap the yarn around making sure the yarn sits in nice little rows as you wrap up to the 12 o'clock mark. 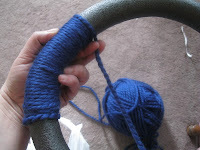 Cut the yarn and tuck in the end piece under a few strands to secure. Start the red color next and wrap as you did with the blue, only to your next mark on your wreath. alternate wrapping your red and white yarns at the different marks on your wreath creating the stripes from the flag, till you get to the start of the blue yarn. Use glue if necessary to secure any end pieces down that you feel you need. I didn't use any glue at all, as my end pieces were all tucked in nice and tight. To make the stars. I went to google images and found a star shape and printed it out. I used an old flour sack towel and cut out 5 stars, but you can use felt, an old t-shirt any old fabric you like. 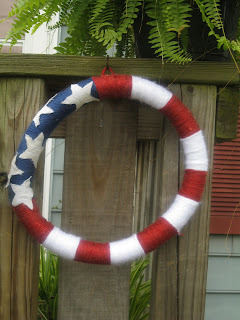 Using the fabric glue, glue down the stars onto the blue section of the wreath. 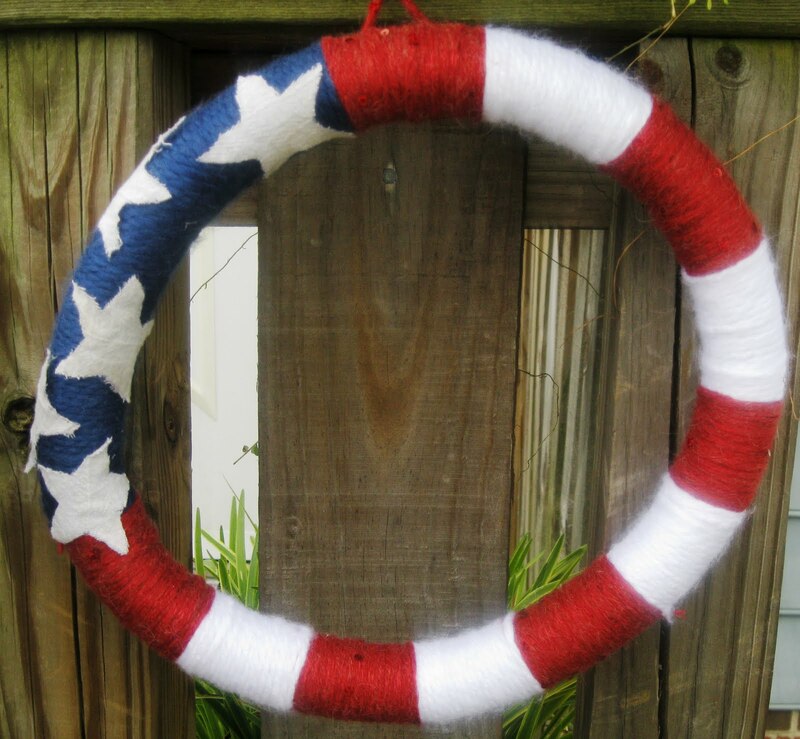 To make a small "hanger" for the wreath, I wrapped a small section of the red yarn, wrapped each end around the top red section and knotted the ends to make small loop on the back side, that blended in with the yarn. Embelish further as you desire. Oh nice! I always say... if its a craft that *I* can do, it must be pretty simple because Im not a crafter. I like this becasue it looks great and seems pretty simple. Thanks, Ill pin this for later! I'm with you! My motto is: If it can be done in 30 minutes with a glue gun, I'm all over it, otherwise forget about it! This one is an easy, quick one! The stars make this stand out -- great for any patriotic holiday. Pinned. Thanks so much for sharing on Busy Monday at A Pinch of Joy. Hope to see you again soon! That is just as cute as can be... and something even I might be able to pull off!